Tommy Sheridan has been jailed for three years following his conviction in December of committing perjury during his News of the World defamation action. In sentencing Sheridan, Lord Bracadale said “By pursuing a defamation action against the News of the World, you brought the walls of the temple crashing down”. For further details on the conviction itself, see our ScotsLawBlog article and commentary. Further, perhaps overshadowing the sentence itself, Wednesday 26 January 2011 saw the first ever tweets being broadcast live from within a courtroom in Scotland. 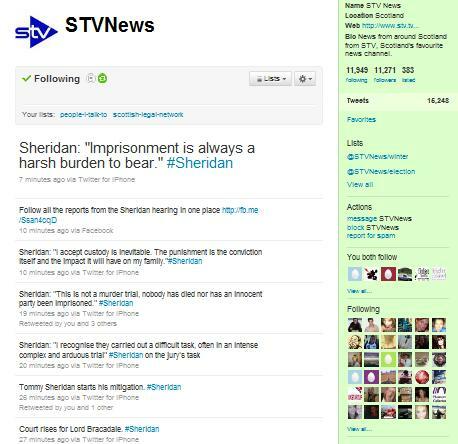 Thanks to STV News, who made a formal written application to trial judge Lord Bracadale, permission was granted for the use of social networking site twitter to provide instant updates from the Tommy Sheridan sentencing hearing. However, this is perhaps not all that suprising given the Lord Chief Justice’s recent interim guidance for the courts of England and Wales allowing journalists to tweet from court under certain guidelines. 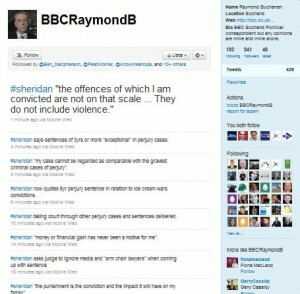 The first instance of tweeting there was during the bail hearing of Wikileaks founder Julian Assange. 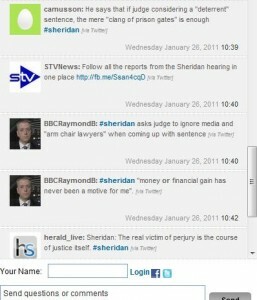 Nevertheless, STV is to be applauded for its initiative in submitting the formal application to the Scottish court. 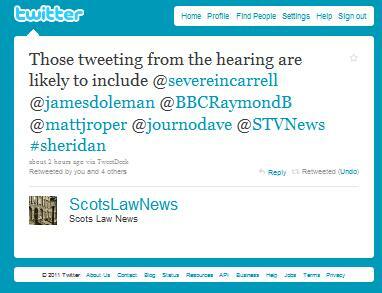 And included others such as @gordonchree (outside of court for STV), @carasulieman (inside court for STV) @camusson, @herald_live, @JudgesScotland, @SkyScot. 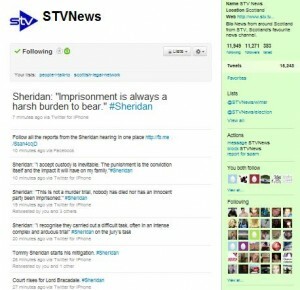 With over 11,000 followers, @STVNews shows a clear appreciation for the value of Twitter in its business. Although not even close to the exposure of some news brands outwith Scotland, such as @BBCBreaking or @CNNbrk, it is certainly dominating the likes of The Herald, which has taken rather a long time to get to grips with twitter, including integration with its website. 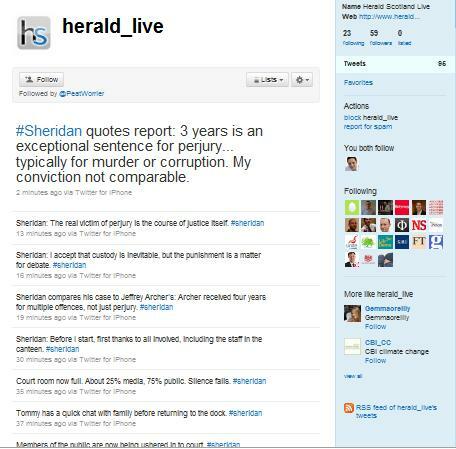 The Herald’s @heraldscotland account has yet to tweet, which shows perhaps a rather undecided stance or, perhaps, one which illustrates a certain amount of apathy for social media. In any event, it is great to see @herald_live and the others listed above taking advantage of Lord Bracadale’s kind permission to use twitter to report the Sheridan trial in real time. Nevertheless, the benefits of tweeting from court far outweigh the risks. 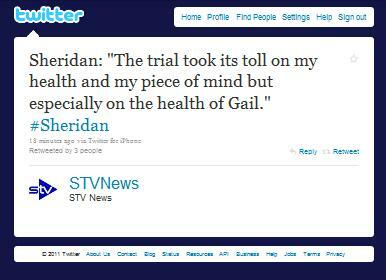 As Tommy Sheridan goes to jail for three years, apart from Sheridan writing a best seller, it is to be wondered if tweeting from prison will be the next thing on the judicial or social media agenda. One would hope not.